For the people who disliked Last Jedi, a particular point of contention seems to be the trip to Canto Bight. Why? Who the heck knows. They say it served no purpose. I mean, there's being wrong, and then there's being wrong. Even leaving aside the obvious meta-narrative purposes of that segment, Finn and Rose go to the casino to find a hacker slicer, and they do; just because it's not the one they intended doesn't mean the trip wasn't a success. Purpose? Served! DJ is never named in the movie - the identifier "DJ" comes from the second half of his personal motto: "live free, don't join." As a character, he's basically what Han Solo pretended to be: a true free agent, in it only for the money. It's just that, unlike Han, when push came to shove, DJ stuck by his principles - or rather, he didn't try to convince everyone that his principles were something other than they really were. For Han, the independent contractor who didn't care about "sides" was a facade, concealing someone who (as we now know) had always cared about doing what was right; for DJ, that's who he is, all the way to the core, and he never made any bones about it. DJ is played by Benicio del Toro, who was allegedly going to be Darth Maul in Episode I until most of that character's lines were cut from the film. The detailing in the facial sculpt is very good, though that doesn't immediately mean the likeness is perfect: just that it has a lot of details. This ends up looking like a cross between Del Toro and Dane De Haan, the baggy-eyed kid from Valerian. And speaking of baggy, DJ's trenchcoat seems too large for him - it's very wide in the shoulders, even accounting for the extra folded flaps that stick out there. The hexagonal pattern on his collar looks very nice, though. The clothes he's wearing beneath the coat seem completely pedestrian, basically just a T-shirt and normal pants, with black boots and a holster hanging from his belt. He's wearing his little pillbox hat, complete with the silver plate attached to the side reading "DONT JOIN" in Aurebesh. Yes, "dont." Aurebesh has an apostrophe, but there isn't one here. 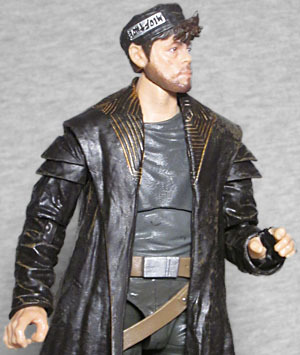 DJ's articulation is the standard for the Black Series, though his long coat does render a lot of it less than useful. Baljointed hips? Swivel thighs? Double-hinged knees? All cool! But since his coat is PVC and will stay the same shape no matter which way it's pointed, you still can't do a lot with him other than have him stand perfectly still and wave his arms around. 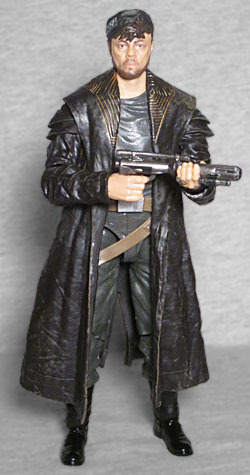 They even went to the trouble of making sure the gun belt wouldn't limit the leg, but it's still inside his coat. So the arms move fine, the chest balljoint is okay, the head is useful... but the legs. The legs. The figure only has two accessories, both guns. There really isn't much more he could have come with, other than Rose's necklace, but that wouldn't have looked great at this scale. The evil mirror universe BB-8, maybe? Eh, that might have taken too much of the budget. The smaller pistol fits in his holster, while the gun with the long barrel will have to be held in his hands. DJ isn't a complicated character, but he is something rare in the Star Wars universe: a scoundrel without a heart of gold. He's exactly who he presents himself as, but that doesn't make him or his subplot pointless. 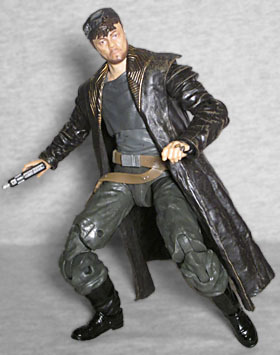 He wouldn't have been high on our list to get a Black Series figure, but they certainly could have done a lot worse.